Why pay $75 to $100 for a black light inspection? First time clients will receive an initial visit which includes up to a one hour black light inspection & pesticide-free scorpion removal service, plus a complete report emailed with photos of your property showing you where scorpions were found. GOOD: Once a month scorpion black light inspection & scorpion removal. $40 for 1 visit. BETTER: Twice a month scorpion black light inspection & scorpion removal. $60 pre-paid* for 2 visits. BEST: Once a week scorpion black light inspection & scorpion removal. $100 pre-paid* for 4 visits. Call now to schedule an appointment. 480-307-4804. (Rates are within 5 miles of 32nd St & Chandler Blvd. Call for rates beyond 5 miles)*All pre-paid scorpion inspections are good for 1 year from date of payment. The Scorpion Equalizer will come to your house for an In-Home tutoring that will educate and entertain the entire family. The course will be customized for your family and for your house. This is a fantastic way to improve your scorpion hunting skills. 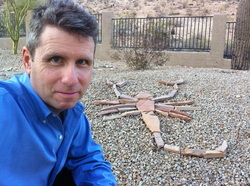 Anyone can learn how to hunt scorpions safely in your own yard. Most importantly... Learn how not to be stung. This is a great way to make sure your family members do not freak out whenever they encounter scorpions. All SCORPION 101 COURSES are custom tailored for your family and your home. Due to high demand for my time these courses are limited and cost $40 per hour including my drive time to and from your home. Schedule a class in your home today! 480-307-4804. Don't have time for a visit from The Scorpion Equalizer at night? Don't have time or money to run out to your favorite coffee house to enjoy a Venti Nonfat Mocha? Ahwatukee residents can have a personal consultation about protecting your home and family from scorpions, plus I will bring you a FREE coffee/tea from your chosen coffee merchant! This is perfect if you want to get some customized advice on how to defend your house and property from scorpions. Having out-of-town guests visit you? Want to entertain that special client? Would you like to show visiting relatives a part of the Wild Wild West? Have a Scorpion Hunting Party! No scorpions in your yard? No problem. BYOS works for me. I will bring the Scorpions! IN ORDER TO INSURE AVAILABILITY, SCORPION HUNTING PARTIES NEED TO BE SCHEDULED AT LEAST ONE WEEK IN ADVANCE! Rates will vary depending on your party date and location. $50 per hour. Call for a discounted quote. 480-307-4804.